PredictWind is top-of-the-line weather and wind forecasting software with full GRIB file viewer and requester, weather routing, departure planning, and more. Used by tens of thousands of users worldwide, PredictWind is a world leader in marine weather and wind software. We offer PredictWind Basic subscription at NO EXTRA COST as a part of our SATTMail Email & Data optimization service subscription. If you require more advanced features like weather routing, trip planner or Iridium GO! tracking (see table below), you can order PredictWind premium subscriptions on this page. Basic: PredictWind Basic subscription with some premium features is included for FREE with our SATTMail optimization service. Just open your SATTMail (XGate) app and click on the Weather icon. Standard and Professional: Decide which PredictWind features you require and purchase the appropriate version on this page. 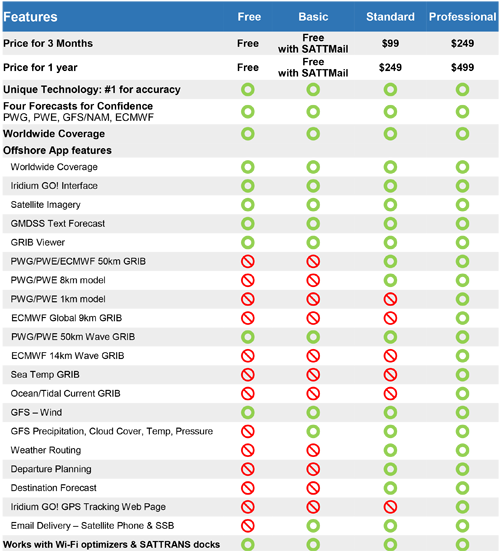 (You can order PredictWind with or without subscribing to SATTMail.) We will contact you promptly with activation instructions.